Create your own contemporary setting with the DAW-710-T adjustable bar table featuring a glossy white table top, chrome gas lift and chrome support. This design will pair with any of our DPV styled barstools to create a tablesetting with modern attitude. Accent your decor and adjust to variable bar heights with ease. A great addition to any home! Style your home with this inviting bar table from the CorLiving Woodgrove Collection. This table will create the perfect spot to relax indoors at a 42 inch bar height. The rich dark brown stained wood base and sturdy table top will create the perfect place to socialize in your home. Complete this bar set with any CorLiving 29 inch seat height barstool from the matching DWG series. This well constructed table offers great value to make the most of your indoor bar space. 42-inch Round Patio Dining Table in Bronze Finish Home Styles Biscayne 42 inch Round Outdoor Dining Table is constructed of cast aluminum with a bronze finish. Features include a powder coat finish sealed with a clear coat to protect finish, attractively patterned table top has center opening to accommodate umbrellas, and nylon glides on all legs. Item Size: 42w 42d 30h. Stainless steel hardware. 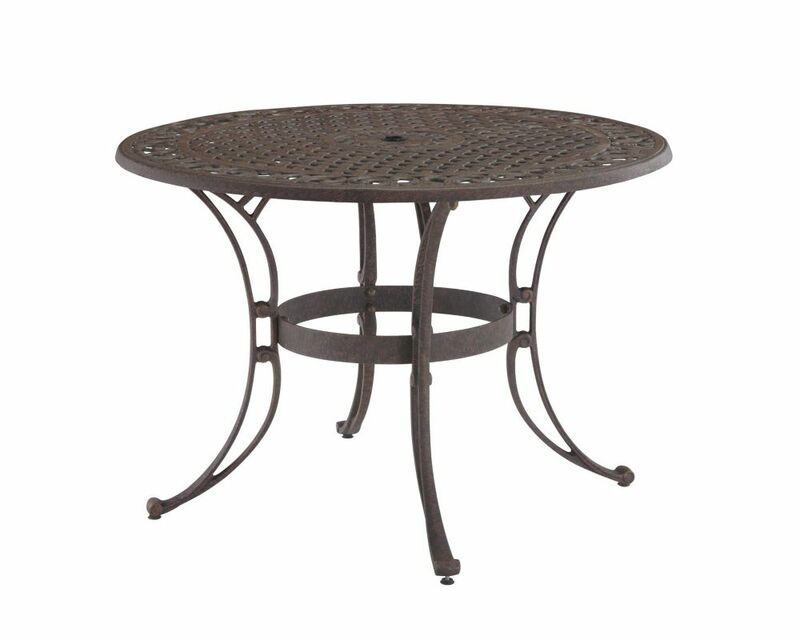 42-inch Round Patio Dining Table in Bronze Finish is rated 4.6 out of 5 by 16. Rated 5 out of 5 by DNelson from Great quality table and very pretty! Assembly was quick... Great quality table and very pretty! Assembly was quick and easy and instructions were clear. The parts were packaged very well and very organized. We look forwardto many years of use! I would definitely recommend this table! Beautiful! Rated 5 out of 5 by Spike from Looks great and was easy to assemble.... Looks great and was easy to assemble. Rated 5 out of 5 by reb from Perfect! Exactly what we were looking for. Couldnt be more... Perfect! Exactly what we were looking for. Couldnt be more pleased. Rated 5 out of 5 by Karen from Great table! Well made. Pretty design. ... Great table! Well made. Pretty design. Rated 5 out of 5 by Cindy from The table is very sturdy and beautiful on our patio... The table is very sturdy and beautiful on our patio beside the pool.